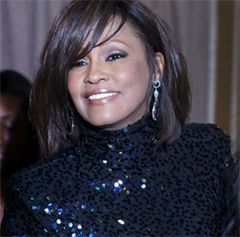 The LA Coroner's office released a summary of Whitney Houston's autopsy report yesterday. You can read it here. She did not die from a lethal combination of cocaine and xanax as many people assumed at the time. While there were traces of Xanax, Flexeril (a muscle relaxer) and Benadryl (an antihistamine) and marijuana in her system, they did not contribute to her death. Alcohol was not a factor. CNN and Fox are broadcasting Whitney Houston's funeral live. Skip CNN, it has pundits talking during it. People, the AP, CBS and other sites are streaming it. If you are watching, or if you aren't but have something positive to say, please feel free to comment. So far it's very upbeat and religious, The point is made that this is a day to celebrate her life. We know she drank alcohol shortly before her death, and we're told she typically took Xanax -- one of the drugs found in her room -- before a performance to calm her nerves, and she was scheduled to sing at Clive Davis' Grammy party. But other sources, like Rolling Stone, with quotes from Clive Davis, say Whitney was not scheduled to perform at the party, she was only scheduled to attend. "She was so looking forward to tonight even though she wasn't scheduled to perform. She loved music, and she loved this night that celebrates music." In the wake of Whitney Houston's death, at Clive Davis'pre-grammy party last night, singer Tony Bennett urged the U.S. to legalize drugs. "First it was Michael Jackson, then Amy Winehouse, now, the magnificent Whitney Houston," he began. "I'd like every person in this room to campaign to legalize drugs." "Let's legalize drugs like they did in Amsterdam," he continued. "No one's hiding or sneaking around corners to get it. They go to a doctor to get it."